I hold an B.S. (2009) and M.A. (2011) in Geography. My research goals have focused on understanding the initiating factors for debris flows within recently burned basins in Southern California. In February, 2014 my masters thesis was accepted into the Journal of Geomorphology. Currently Lead the WeWork Reality Capture team. Terrestrial Laser Scanning location in a debris basin. November, 2010. Pasadena, California. I have leveraged my expertise in ArcGIS to provide GIS consulting to large companies and individuals. Experience in Forestry, Demographics and Telecommunications. 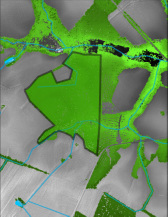 Tree stand shown with topography, water features and tree canopy (darker green represents higher tree heights). All extracted from LiDAR.